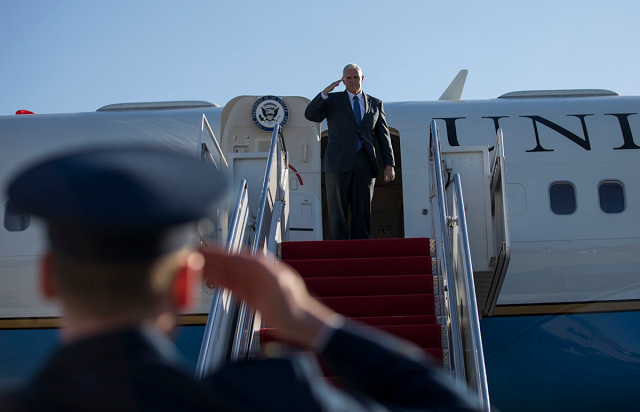 KENNEDY SPACE CENTER, Florida - Vice President Mike Pence will arrive in Air Force Two on the former space shuttle landing strip at NASA's Kennedy Space Center around noon on Thursday. The vice president, who also serves as the chairman of the National Space Council revived by President Donald Trump, will tour Kennedy Space Center to learn more about the center’s work as a multi-user spaceport for commercial and government clients. Pence will also see the agency’s progress toward launching astronauts from U.S. soil on spacecraft built by American companies, and traveling past the moon, and eventually on to Mars and beyond with the help of NASA’s new Orion spacecraft and Space Launch System rocket. After the tour, Pence will make a speech to space workers that is scheduled to take place around 1 p.m. Eastern Daylight Time. The speech will be broadcast live online.